Say hello to Armenian Tahini Bread -- think cinnamon buns, sticky rolls or sweet rolls -- a complete surprise and an utter delight! The recipe comes straight from the pages of Saveur (January? February? can't tell), my new favorite food magazine. Every issue has one or two recipes that completely capture my imagination. And not only do I love-love-love this tahini 'n' sugar sweetened bread, the dough itself is so beautiful to work with, I think it's my 'new go to' recipe for cinnamon rolls. 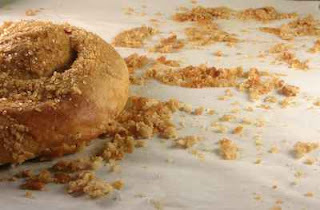 Saveur describes the rolls as a 'croissant mated with halvah' and goes on to say, "This unprepossessing sweet yeast bread - eaten by Christians in that country during Lent, when the church forbids the consumption of dairy products - awakens the senses the moment it leaves the oven, with the seductive aromas of sesame and cinnamon. The real joy, however, is in the bread's flaky yet chewy texture ..."
The rolling technique is a little messy -- not difficult, just messy with oozing tahini. Next time I'll roll the dough differently. The roll in the picture above was the size of a salad plate -- too big except to share several ways but also too thick for the flaky sweetness to easily form while baking. Shoot for the golden dark color in the lower-most left-hand corner of my photo, it took more oven time than specified to develop. NEXT TIME It's easy to imagine adding pistachio nuts, currants, other bits of dried fruit. A YEAR AGO Vegetable Coconut Curry with Shrimp Check the comments to see who mentioned moving to St. Louis! She has! Stir together the yeast, sugar and warm water and set aside. If it gets bubbly, you know the yeast is good. Mine took a long time to proof, nearly 30 minutes, I almost started over since it should only take about 5 minutes. If it doesn't get bubbly, then the yeast is dead and you do need to start over with new yeast. Whisk the water and olive oil in a large bowl, then add the proofed yeast and the flour and cinnamon. Mix into a rough dough. Move dough to a countertop dusted with flour; be sure to keep the flour bin nearby. Now knead the bread for 8 - 10 minutes, adding flour to prevent sticking, til it becomes smooth and elastic. Let dough rest for 10 minutes. (Divide into two pieces if following my rolling method.) Preheat oven to 350F. Line two baking sheets with parchment. [I used two different types of baking sheets. The Airbake seemed to help form the flakiness better. I wouldn't skip the parchment, not for easy clean-up but for even baking.] Lightly flour the counter to roll out the dough. Saveur's way: With a rolling pin, roll out the dough to a 25" circle. Spread with tahini and then sprinkle the sugar evenly over top. Cut a one-inch circle in the center of the dough and put aside, this creates a 'donut' of sorts. Starting from the middle, roll the edge of the dough over itself, working your way around the hole in the center. Continue rolling the dough over itself until a large circular 'rope' is formed. Cut the rope into six pieces. With each piece, form a tight coil and place onto the baking sheet, leaving room between. Press with the palm of your hand to flatten. [Again, the thinner the better.] [Hmm. I skipped this next step, I'm guessing it was important and would have promoted the browning and flakiness.] Mist each round of dough generously with water. My way, the next time: With a rolling pin, roll half the dough (keeping the other half covered) into a rectangle. Spread with half the tahini and half the sugar. From the long edge, roll the dough over itself to form a rope. Gently stretch the rope to lengthen. Cut each long rope into as many lengths, each one should be long enough to form a tight coil. Transfer to baking sheet and flatten. Mist each round of dough generously with water. Sprinkle tops of buns with the raw (demerara) sugar. Bake for 20 - 30 minutes (my big ones took up to 40) until the exterior turns quite brown and flaky. Remove from oven and cool. I will try this one for sure. scrumptious. we can smell it from here. Wow, this looks so delicious. Perfect for the snowy Valentine's Day we're expecting. Alanna, I've been dreaming of this bread ever since I saw the photo. Thanks so much for entering it in the Vegetable Love challenge! Karen ~ It's got your name on it! Jai & Bee ~ That's a long ways! Mandira ~ It's snowing here right now and it's all I can do not to make another batch! SusanV - You're welcome, twas fun so thanks for hosting. And I know about 'dreaming' about this: see my note to Mandira! i've been eating up tahini like a crazy person lately and this bread looks good. now i just have to get over my fear and try baking with yeast! Alanna, I am so excited to see this...cinnamon buns have been long on my to-try list, and this looks like a delicious and innovative version! Very drool-worthy. Oh, thanks for this recipe! When I lived in RI, I used to buy sweet rolls from a wonderful Armenian bakery. Yours remind me of them. The combination of tahini and sugar sounds divine. What a unique bread...I can't wait to make it. I just made this bread last week and it was fantastic. I only used about 1/4 cup of sugar for the entire recipe to make a less sweet version and it turned out great. Bridg, you made my day, thanks! And it's so good to know about the sugar reduction.